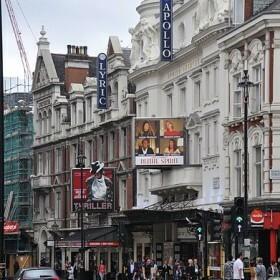 The Apollo Theatre is located on Shaftesbury Avenue in London's West End. The theatre is owned and operated by Nimax Theatres and has 658 seats currently over three levels. Named for the Greek god of the arts and leader of the muses, because it was designed and built as a venue for musical entertainment, The Apollo Theatre first opened its doors in February 1901. In 1920 the actor George Grossmith and Edward Laurillard became managers, presiding over a series of plays and revivals. Prince Littler took control in 1944 and presided over some of the theatre’s most popular productions. Seagulls Over Sorrento (1950) ran for over three years, but the theatre’s longest run was Boeing Boeing (1962) which starred Patrick Cargill and David Tomlinson. The play eventually transferred to the Duchess in 1965. Sir John Gielgud was the Head of the cast in Alan Bennett’s Forty Years On (1968) and returned to play opposite Ralph Richardson in David Storey’s Home (1969). He was to make one of his last stage appearances here as well, at the age of 83, in Hugh Whitemore’s Best of Friends (1988). 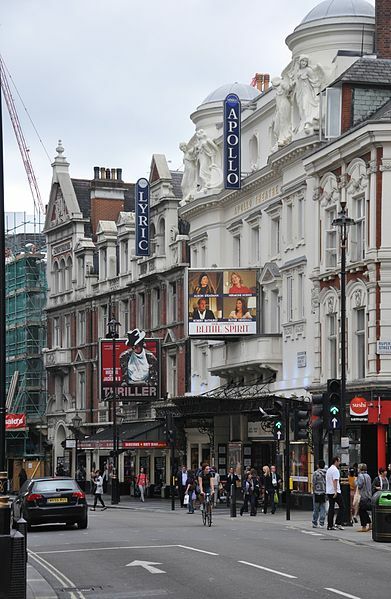 From 1975 the Apollo was part of the Stoll Moss Group until purchased by Lord Lloyd-Webber’s Really Useful Group and Bridgepoint Capital in 2000, making it one of eleven Really Useful Theatres in London’s West End. 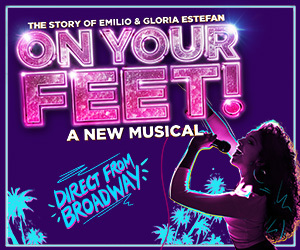 In September 2005, during the run of The Big Life, veteran producers Nica Burns and Max Weitzenhoffer purchased the Apollo Theatre, along with the Lyric, Garrick and Duchess Theatres, creating Nimax Theatres. 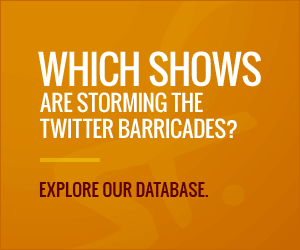 The Vaudeville Theatre completes the Nimax portfolio. It’s farewell Alfie Moon and hello drag artist Hugo/Loco for Shane Richie as he joins Everybody’s Talking About Jamie at the Apollo Theatre from 28 January until 4 May 2019 alongside another new recruit, Layton Williams’ in the title role.